Linfield boss Warren Feeney is looking forward to taking on Premiership champions and leaders Cliftonville at Solitude on Tuesday night. The Blues, who lie just a point behind the Reds, are expected to pose the biggest threat to the north Belfast side making it three titles in a row. "It should be a great match, playing the champions in their own backyard" said Feeney. "It's one you should love playing in and the boys will be well prepared." 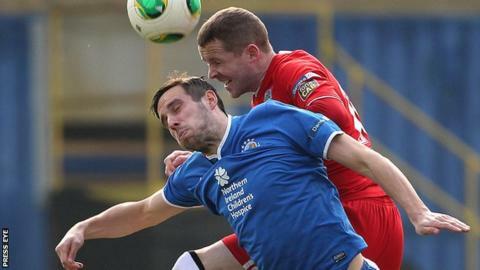 Both sides are coming off weekend wins with Cliftonville hammering Ballinamallard 4-0 and Linfield clinching a 1-0 victory at Dungannon Swifts. Cliftonville's clash with Linfield is the feature game on a Sportsound Special, presented by Michael McNamee on Radio Ulster MW starting at 19:30 BST on Tuesday. Michael Hammond and Liam Beckett will take you through the action while there's also commentary from Glentoran v Portadown. There will reports from the other Irish Premiership fixtures. Ballymena United lost top spot after Friday night's 2-1 defeat at Glenavon and they will aim to bounce back against Institute at the Showgrounds. Glentoran boss Eddie Patterson is also hoping for a positive response from his side against Portadown at the Oval following the 1-0 loss to Crusaders on Saturday. "We've got to learn from the Crues game and take it into Tuesday's match with Portadown," said Patterson. "Portadown have signed some very good players including the Linfield trio of Gault, McAllister and Garrett. "Add to that the firepower of last season in Twigg and Murray. We are under no illusions, this is going to be a very tough game. "It will be similar to what Crusaders threw up to us - big at set-pieces and it's something we've got to deal with." The Ports will be without defender Keith O'Hara, who is suspended after his dismissal in the scoreless draw with Coleraine on Friday night. Basement club Warrenpoint Town are still seeking their first point of the campaign as they prepare to take on Dungannon at Stangmore Park. Ballinamallard are winless after five game and Whitey Anderson's side face a tough task against Glenavon at Mourneview Park. Crusaders travel to take on Coleraine with skipper Colin Coates determined to build on the win over Glentoran, which moved the north Belfast side to within three points of the summit. "We need to try to kick on from here - we've got a target for the next three or four games starting with Coleraine," said Coates. "We've been up there for the last two or three seasons and we want to take that extra step."